The grounds of the Grand Turk hospital. Constructed in 2010 as a counterpart to the Providenciales National Hospital, the 10 bed Grand Turk Hospital is found in the Over Back area on the northern side of Cockburn Town. 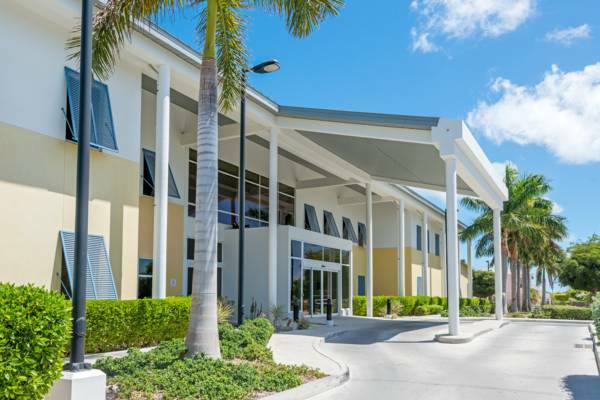 Although outfitted with a great range of operating theatres, imaging and diagnostic equipment, this complex shares some specialized staff with the more extensive Providenciales site. Also as is the case with the Providenciales Hospital, Canadian company InterHealth Canada manages Grand Turk’s hospital, and standards are monitored by Accreditation Canada International. The entrance to the hospital.